Looking beyond the traditional bucolic views of the Delaware River, New Hope Impressionist John Folinsbee chose to paint the mills, factories, and bridges of the waterway, and was drawn to the architectural beauty of the barns, quarries, and slag heaps of the region. Stylistically, Robert Spencer (1879-1931) differed radically from his New Hope colleagues. Peterson will tell the story of Spencer’s colorful yet tragic life, using as sources the written recollections of his two daughters as well as extensive new research. The lecture also examines the artist’s work, from his early, unformed beginnings to his mature New York City and European images. 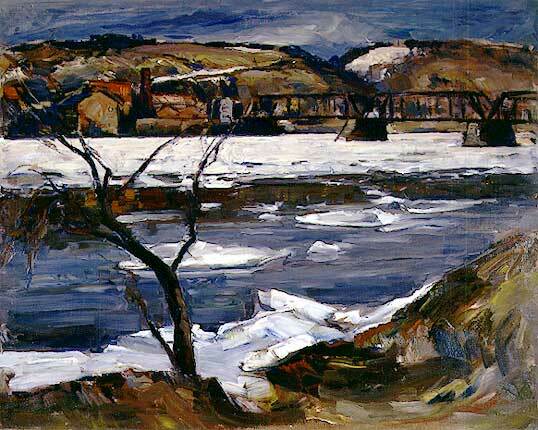 Approaching his work with a fearless independence, Folinsbee brought emotional force and vigorous brushwork to the canvas, as seen in his 1935 painting “River Ice” from the James A. Michener Art Museum permanent collection. The Michener collects, preserves, interprets and exhibits American art, with a focus on art of the Bucks County region. You can see this work and read more about Folinsbee on the Bucks County Artist Database. The Woodmere’s exhibition, John Folinsbee and American Modernism,on display through March 6, 2011 explores Folinsbee’s work from 1920-1940 – including many pieces rarely seen by the public – revealing the artist’s contributions to 20th-century American art. Lecture Admission: $15, $12 for members. For visitor information, please call (215) 247-0476 or visit www.woodmereartmuseum.org.